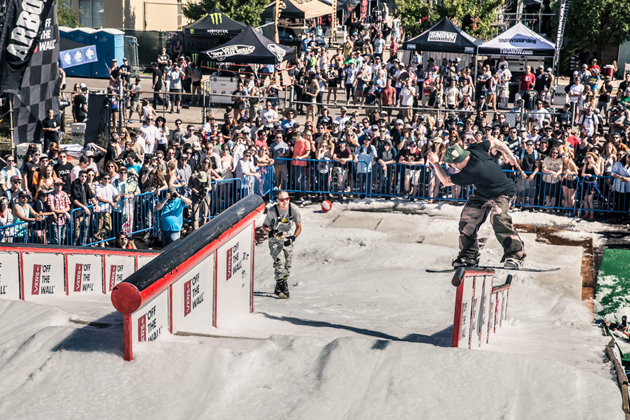 DENVER, Colo (May 26, 2016) — Discount pre-sale tickets go on sale tomorrow for Snowboard on the Block Festival presented by SNOWBOARDER and TRANSWORLD SNOWBOARDING with savings of up to $20 off each weekend festival pass when purchased before June 13th. The biggest snowboarding event of the year is back bigger and better than ever, October 14-15, 2016, at Sculpture Park and the Denver Performing Arts Complex for two days of music, snowboarding films, a pro rail jam, an enormous gear sale and more. Snowboard on the Block is the only snowboard festival in North America dedicated to showcasing the best films the snowboard community has to offer. The festival features the newest releases from around the globe, from world-renowned production crews. This year will see an all-new rail jam setup featuring some of the best riders in the industry on real snow brought in especially for the weekend. Top touring musical acts, announced soon, will play throughout the weekend. The ever-popular discount gear sale will offer up to 75 percent off retail, and, some of the best food and drinks Denver has to offer will be onsite. Early Bird pricing won't last long, so buy yours now before prices go up! SNOWBOARDER Magazine is entering its 28th year of documenting the sport of snowboarding. Since day one, SNOWBOARDER has been the inspiration for riders to go out and shred, indulge in their passion and progress their skills. The name says it all: If you’re a snowboarder, then SNOWBOARDER is for you. The magazine is part of TEN: The Enthusiast Network that reaches more than 45 million active sports enthusiasts each month through an integrated network of magazines, online properties, events and television programming. snowboarder.com. TRANSWORLD SNOWBOARDING is the world’s number one snowboard media outlet with an audience of over 1.4-million. Celebrating 25 years since its inception in 1987, TRANSWORLD SNOWBOARDING continues to successfully and creatively cover the snowboard culture with innovative photography, original videos, award-winning print and multi-layered digital magazines, snowboard instruction, consumer events and cutting edge awards shows. TRANSWORLD SNOWBOARDING can be found online at transworldsnowboarding.com and is based in Carlsbad, California. TRANSWORLD is a division of TEN: The Enthusiast Network.